A Belfast company developing pioneering heart monitoring technology for everything from steering wheels to clothing has announced the capture of £4m from a fresh funding round. 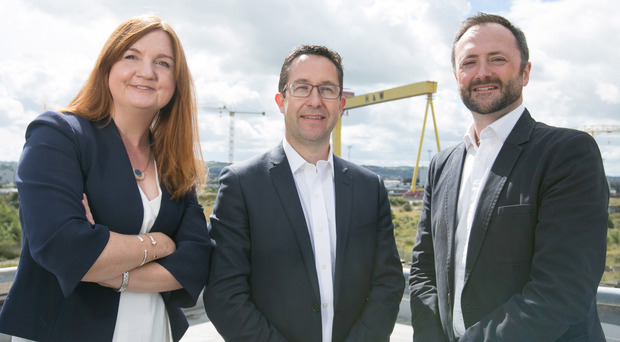 Biometrics firm B-Secur, which is based at the Catalyst tech hub in the Titanic Quarter, has earned a growing international reputation for its innovations. In January, the company unveiled new product Heartkey at the world's biggest tech event, CES in Las Vegas, where it garnered significant attention. B-Secur said the technology combines unique user identification with advanced physiological monitoring for health and wellness purposes, including medical grade heart rate, stress and fatigue monitoring, which it said can be applied to everyday situations such as driving a car, or for real-time health monitoring in the home. The company has already established partnerships to embed its technology into cars made by major motor manufacturers and wearable devices made by global tech firms. The second round of investment in B-Secur is from a syndicate including Accelerated Digital Ventures (ADV) and Kernel Capital, manager of the Bank of Ireland Kernel Capital Growth Funds, both of which supported the firm's previous funding round. The Belfast company's workforce has grown from five to 35 in a year. Company chief executive Alan Foreman said he expected another 10 people to be recruited this year. B-Secur is also moving towards a new base in the San Francisco area. "Securing further investment at this critical stage recognises our rapid development over the past 18 months and the market relevance of B-Secur's technology," he said. "Most importantly, it's a strong indicator of B-Secur's growth potential on a global scale. "Heartkey's algorithms offer data protection for devices and vehicles. It also offers the added benefit of providing insights into an individual's physical wellbeing, which enables a wide range of life-enhancing or potentially life-saving benefits," he added. "We're at a really exciting stage for the business, we have forged very significant links with big name partners who recognise our technology's value and importance to their own product development and this investment will allow us to continue driving our ambitions for B-Secur forward." Tong Gu, investment lead at investors ADV, said: "When everyday wearables become medical grade devices, the importance of assuring who can access sensitive information is of the greatest importance. "B-Secur's Heartkey software enables any OEM (original equipment manufacturer) to achieve near medical grade heart monitoring and tracking capability coupled with unique authentication. "We're backing B-Secur for the second time because we truly believe in the product vision and the team." Kernel Capital partner Jayne Brady added: "Since our first investment with B-Secur we have been impressed by the drive and determination of the management team and their highly skilled technical experts who have worked hard to elevate this technology and to pair it with partners and applications which we believe will change how we live and work. "They are at an exciting stage and we are very proud to support them in taking their vision forward on a global scale."